OLATHE — It wasn’t that becoming a permanent deacon was a strange idea for Deacon Brad Sloan, a member of Mother Teresa of Calcutta Parish in Topeka. Rather, it wasn’t an idea at all. He wasn’t even looking for it. “It’s not something that I would have ever chosen for myself,” he said. “In fact, it was the furthest thing from my mind when it was suggested by my spiritual director that I look into it. 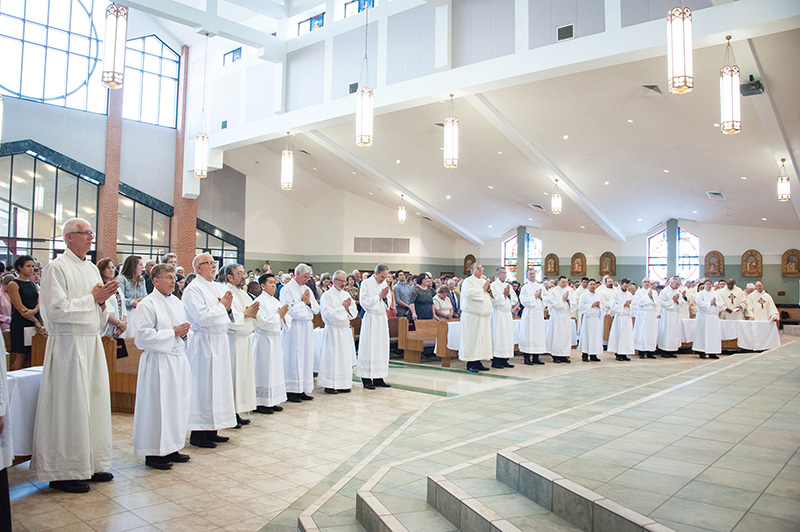 Nevertheless, about five years after his spiritual director raised the possibility of him becoming a cleric, he joined 16 other men to be ordained a permanent deacon by Archbishop Joseph F. Naumann on June 3 at Prince of Peace Parish in Olathe. What a long, strange journey it had been. The 17 new permanent deacons are the second “cohort,” or group, to be ordained for the Archdiocese of Kansas City in Kansas. They join the members of the first cohort ordained in 2011, and other permanent deacons who were ordained elsewhere but moved into the archdiocese. Despite having apostolic origins, the clerical office of deacon is still unfamiliar to many Catholics. Although the establishment of the diaconate can be found in the Acts of the Apostles, the office slowly disappeared until it became a temporary state before priestly ordination. Pope Paul VI restored the permanent diaconate in 1967. Catholics, who had been used to transitional deacons and celibate priests, were a little confused by the advent of permanent deacons with wives and children. The unofficial and erroneous term “lay deacon” arose. Actually, permanent deacons are no longer laity but members of the three ranks of clerics, which are deacon, priest and bishop. “Part of this confusion, this misnomer of ‘lay deacons,’ results from the fact that most permanent deacons — as evidenced by our 17 candidates today — are married,” said Archbishop Naumann in his homily. Members of the second cohort gave different reasons for wanting to be a deacon. Some, like Deacon Sloan, felt they were called. Others, like Deacon Tim Ruoff, described it as being “led by the Lord.” Deacon Ralph Schramp wanted to “give something back to the church.” Deacon Marcos Navarro saw the ministry of service done by permanent deacons as a continuation of his life and something he’d like to do. “I was in [the] seminary and discerning the priesthood from 2005 to 2007, and I remember [discerning] that even though I wasn’t called to the priesthood, he was calling me to ministry in the church,” said Deacon Nicholas Moragues, a member of Good Shepherd Parish in Shawnee and director of formation there. As aspirants and then candidates, the newly ordained deacons faced many challenges along the way. Deacon Joe Allen and others mentioned the challenge of balancing the demands of family, work and formation. Deacon Navarro spoke of his worldview and mindset changing from a secular to a spiritual focus. Deacon Schramp talked about learning new disciplines of a more rigorous prayer life. And Deacon Moragues mentioned the long period of formation and rigor of the academic aspect. Just before their ordinations, the 17 men received their first assignments as permanent deacons. As expected, their ministries will involve various forms of service. Many will also be proclaiming the Gospel and preaching at Mass, performing baptisms, preparing couples for marriage, and presiding at marriages and funerals without a Mass.